If you install SaveSys on your computer, you will undoubtedly start seeing commercial ads because the program is a typical advertising-supported application. The program might not only show ads, but also perform other undesirable activities, so you should remove it without further consideration. Luckily, it is rather easy to delete this program from the system because it can be erased via Control Panel. Do not worry if you do not know how to remove SaveSys because we will explain you how to do that in this article. You will definitely notice that various commercial ads have started appearing on your screen if you install SaveSys on the system. 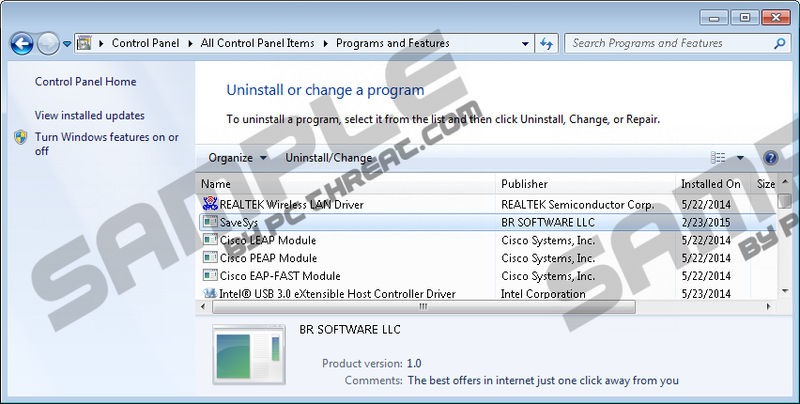 The program might seem completely harmless at first sight; however, it has to be emphasized that its ads might cause serious harm to your PC. Therefore, we suggest that you ignore all those commercials and remove SaveSys from the system. If you delete this adware program from your computer, pop-ups, banners, and other types of ads will not appear on your screen anymore, which means that you will reduce the possibility to encounter malicious software. On top of that, nobody will collect information about your online habits or connect to the Internet without your permission anymore. It does not seem that SaveSys has its official website, so we believe that this program has been installed on your computer during the installation of a completely different application. This usually happens when users download software from untrustworthy websites and do not pay enough attention to the setup wizard. As you have probably understood, SaveSys might not be the only unreliable program installed on your computer, so it is very important to check the condition of your system and remove all the suspicious applications. If you do not want to allow them to slither onto your PC in the future, make sure that you install an antimalware tool on the system and surf the web very carefully. In order to remove this Brazilian adware program, you have to go to Control Panel and delete it from there. Less experienced computer users should use our manual removal instructions. They are placed below this article. Of course, we understand that our instructions might seem too complicated, so if it happens that they do not help you to remove SaveSys, make sure that you scan your computer with a trustworthy malware remover, such as SpyHunter. We believe that it is worth investing in this tool not only because it can erase different kinds of infections, but also because it will protect your PC from harm 24/7. Quick & tested solution for SaveSys removal.